I'm still here. I check (unread posts since last visit) on this forum most days just to keep up with whats happening. I dont have much time or money lately to restore any of my bikes but there will come a time when that will happen. I ride my 1947 A7 on a daily basis and love it. Good to hear from you. Daily rides on the rigid out in beautiful Australia? Life could be worse. Well, i`m still here too,although i`ve been a bit busy these last few months moving house and re-locating to west devon. I am currently converting an old sheep cott into a home for my A10, so i can finally ride the great roads around here which seem to have been made for an A10 can`t wait! build it, ride it, live it! What will you do with the sheep? I believe riding those roads must be great and I am continually in the "grass is greener" mode when it comes to comparing riding here with about anywhere else, though, there are some nice spots. I think it must be totally accurate to say the bikes were made for your roads. I think your engine is in good hands. Happy riding, when the time comes. Good to here from you guys. As you can see from my previous post on the old pinking thread I am still about, Richard from Minety, my Super rocket is still going well and hopefully will be taking me to the I.O.W british bike rally iin September. The electric start is still working A1 over a year now! I have not ridden much this summer due to lack of time,the haymaking season is over than goodness, also our French bulldog had 5 puppies 8 weeks ago talk about time wasters, it goes in one end and comes out the other, at my age trying to round them up after giving them the run of the garden is difficult, the drawback is that only one is sold, just hope it does not stop me from riding to much before the bad weather sets in. The BSA 350 unit single special bitza I am building has come to a halt at present as well due to lack of time and I still have a trailer of auto jumble to unload and put somewhere after not getting rid of it after Bill Littles open day jumble. 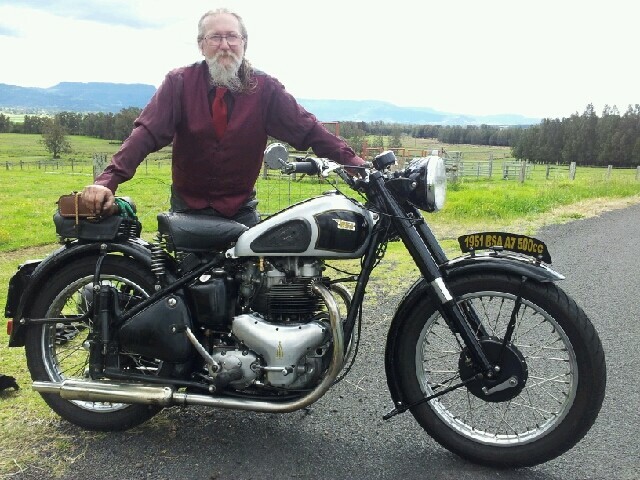 I have arrived back in OZ from UK (4 years), and are now back in our home in Canberra, The BSA arrives Sept 11th. I will be doing a "dummy" rebuild first to see what if anything is missing (this bike was purchased in pieces, and boxed). Then will strip it down and do a concourse rebuild, i will keep everyone up to date by the number of question i will be asking. What will you do with the sheep? Let`s just say i have bought a lot of mint sauce recently. I was resetting my tappet clearances after tightening down my rocker box fixings, you know the way it goes...oil weeping from the box joint and the first reaction is to squash the gaskets down tighter which then needed the tappets reset since the fixings tightened down quite a bit and calamity, I dropped the tappets' allen key down the push rod tunnel. I couldn't see it so went fishing with my little magnet on the end of the telescopic thingy but no luck, it kept 'sticking' to the SRM push rods. So I bent the end of the telescopic thingy to get further away from the push rods to where the key must be and snap, I broke it while bending it. So, eventually I had to lift the rocker box off to retrieve the key. Now you all know that replacing the rocker box is a pain, and it was. Glad I got that off my chest! Apart from that she's going well. Member of the 'Last of the Summer Wine Club - Jennycliff'. Have sent an email with invitation to post here to all who have not logged in for approx 250 days+, got many 550 errors (undeliverable \ non-existing email address) in return, let's hope most receive the mail and maybe posts a few words. This thread is going well. Welcome back to all of you. Kiwipom, Yes, I recall when you posted about the quakes, glad things are looking up for you. Rich, After Googling them, those look like great dogs. You must be up to your ears in dog ears. There have been a couple of times this season when I wished for an electric starter, but don't know if it would have just meant a dead battery. Pato, Wondering if a "dummy" build is common or if most folks don't just do like me and fit-as-you-go. Maybe that's the real dummy build. Anyway, are you missing the UK or glad to be back in Oz. If I recall from reading about it, Canberra may not be the tourist and cultural center of the world. No offense, I hope. Alan, Sounds frustrating. In hind sight, maybe a flexi/grabbi claw tool and a bendy mirror to see your way might have worked. Though, with the luck you were having, the mirror would have broken off in the hole. JB, ah, another member in thinkin'-'bout-it distance from where I am in the Chicago area. Been meaning to get to the Mid-Ohio, but it's always a challenge ('tain't around the corner). So, does it help to have Domiracer in your backyard? Their lack of photos is frustrating.